Mill-Max offers a series of right angle test points designed for thru-hole mount at the edge of a printed circuit board. 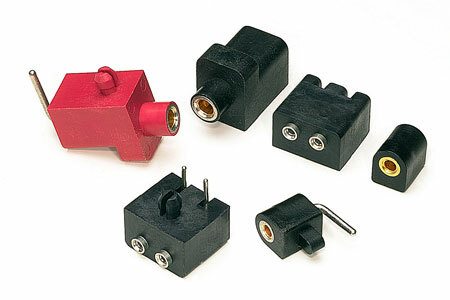 The individual test points accept probe diameters of 1, 1.5 and 2mm; the two-pin socket will accept a halogen lamp having 1mm diameter leads on 4mm centers. All test points use precision-machined brass pins incorporating beryllium copper "multi-finger" contacts for maximum reliability. Insulators use high temperature thermoplastic that is suitable for hand, wave or intrusive reflow soldering. Insulators can be molded in various colors for visual identification of power and ground.